Notable banking-related collections include the records of the Bank of North America  and the Philadelphia National Bank , and the papers of Thomas Biddle (various collections) , Clement Biddle (letterbooks) , Jay Cooke , and Albert M.Greenfield . Fire insurance is well documented through the records of the Franklin Fire Insurance Company of Philadelphia , Mutual Assurance Company (Greentree) , Philadelphia Contributionship for the Insurance of Houses from Loss by Fires , and the Pennsylvania Fire Insurance Company . (In-house indexes are available for all four companies. The Franklin Fire Insurance Company and Pennsylvania Fire Insurance Company records may also be searched via Bryn Mawr's "Places in Time " website.) A related collection, the Hazlett and Moss records , contain the records of a real estate company active in residential development in the city and its suburbs from 1902 to 1927. 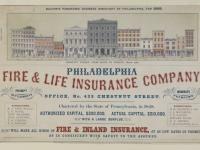 The Frankford Mutual Fire Insurance Company  records focus primarily on the Frankford, Bridesburg, and Kensington sections of Philadelphia, and the records of the Insurance Company of the State of Pennsylvania  and the Philadelphia Insurance Company  concern marine insurance. The history of merchants and trade can be traced through two large collections – papers of the Cope family  and Hollingsworth family  – and numerous smaller ones, among them the papers of Jeremiah Boone , Jones and Clarke , Paschall and Hollingsworth , William Redwood , Reed and Forde , John Reynell (in the Coates and Reynell family papers ), Shippen family , and Claude Unger , and the records of the Port of Philadelphia  and the United States Customs House  in Philadelphia. Documentation is strongest for the colonial and early republic periods. Collections related to printing, publishing, and other media include the Bradford family  and George Horace Lorimer  papers and the records of Lea and Febiger , Curtis Publishing Company , Atlantis newspaper , Polish Star Publishing Company , Fiorani Radio Productions , and Voice of the Lithuanian Community  radio program. Transportation-related collections include the records of the Union Canal Company , Germantown and Perkiomen Turnpike Company , and Baltimore and Philadelphia Steamboat Company , and the papers of lumber dealer Lewis S. Coryell  and railroad executives Jay Cooke  and Samuel Morse Felton, Sr. and Samuel Morse Felton, Jr. (in the Felton family papers ). The manufacture of transportation vehicles is documented through the papers of shipbuilder Joshua Humphreys  and the records of Franklin and Company  (which made wagons and carts), J. G. Brill Company  (streetcars and buses), Autocar Company  (automobiles), and Baldwin Locomotive Works  (see also the Samuel Matthews Vauclain Papers, Collection 1900A ). The Philadelphia Rapid Transit Company photographs  document the construction of Philadelphia’s mass transit system. The Harold E. Cox transportation collection  documents the Philadelphia Transportation Company (PTC), its predecessor the Philadelphia Rapid Transit Company (PRT), and that company's subsidiary and predecessor rail lines. The Society also holds many published works related to transportation, especially railroads. Other manufacturing-related collections include the extensive HSP forges and furnaces collection  and the records of William H. Horstmann and Sons  (uniforms, insignias, and flags), Fletcher Works  (textile machinery), L.H. Alden and Company  (tanning), Jonathan Meredith Tannery (in the Meredith family papers ), and C. Schrack and Company  (paint and varnish). On the soap manufacturer Fels and Co., see the Samuel Simeon Fels papers . The large John Wanamaker collection  documents a leading Philadelphia retailer. Collections representing dry goods and grocery businesses include the HSP collection of Hamilton & Hood records , West family business records , and Wister family papers (collection #1625B) . The Wister family papers  also cover the family’s earlier wine merchant business. The Wood and Bacon account books  represent a general merchandise firm, and the Penington family papers  and McCarty and Davis records  document booksellers. HSP's collection includes the records of Kirk & Nice, Inc. , recognized as the oldest continuously operating funeral establishment in the U.S. Other collections related to the business of funerals and undertaking include the Oliver H. Bair Company , the Andrew J. Bair Company , and David H. Bowen and Son . Several collections document Philadelphia businesses owned by people of color, including the papers of the Tayoun family  (restaurateurs) and the records of Albert E. Dutrieuille Catering , Warley Bascom Sons  (upholstering and interior decorating), and the Spanish Merchants Association , which promoted Latino business development in Philadelphia. Other major business-related collections include the Coxe family mining papers  and the real estate portion of the Albert M.Greenfield  papers. Also of note is the Society’s extensive collection of trade cards  from the 19th-century Philadelphia region.